NYAnything: 沒空做感恩節必吃的蘋果派嗎？？ Calling all friends in NYC area!! Sour Cream Apple Pie for YOU to order. 沒空做感恩節必吃的蘋果派嗎？？ Calling all friends in NYC area!! Sour Cream Apple Pie for YOU to order. Thanksgiving is only 10 days away, some of my friends are asking me what dessert to buy or where to get best pie in the city?? Here is the answer, at Jessica’s!! This year, I decide to offer a few SOUR CREAM APPLE PIE for my dearest friends in NYC area. 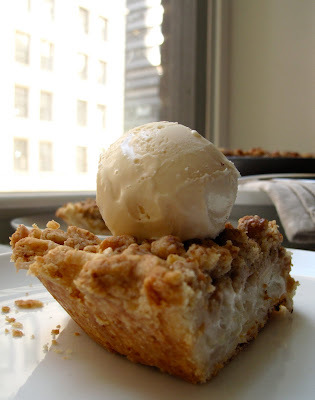 If you like Little Pie Company's Sour Cream Apple Pie, You will be crazy for mine!! I think they are even better. *100% hand made, by Jessica. *Use the best, and most organic ingredients I can find. 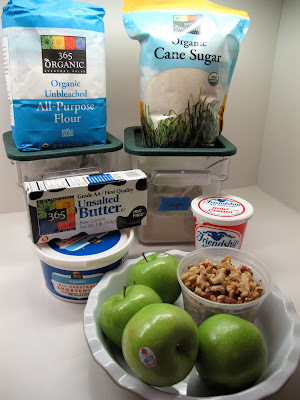 *Every pie, use about 6 green market apples and I do use both butter and vegetable shortening in the pie dough, and they both are from Whole Foods Market 365 Organic brand. *The pies will be baked at 11/25 Wednesday morning (the day before Thanksgiving), and can be pick up at 11/25 late afternoon ( around Union Square, so easy for everyone to get there), so you will have a fresh pie for your Thanksgiving dinner. Pack with pile of hand sliced apples, still a little crunchy, not mushy, and a little tart, not as sweet as other apple pies. Just enough sour cream to hold everything together. The walnut streusel is buttery, crispy and they are perfect on top of every slice. The bottom and the sides are golden brown!! The pie crust has the right thickness. Even with the next day, still will be light, crispy and flaky. So order away, my friends and Happy Thanksgiving, everyone!! so nice, I LOVE LOVE LOVE this sour cream apple pie. Too bad, you guys are here.......otherwise it definitely will be on our Thanksgiving table! 我想Order蘋果派啦!可是文章說for your dearest friends in NYC area.我在midtown east 工作，可是素昧平生，怎麼也不算one of dearest friends. (只是忠實讀者)。如果Jessica也開放給讀者訂購，那我再寫email給妳囉! Thank you so much! and it will be a pleasure to meet you in person. The pie looks great and Jessica sounds like an interesting person to meet. We are friends of your friend in Taipei, Wen-Chi? We live in New Hyde Park but will be in Manhattan this coming Sunday. 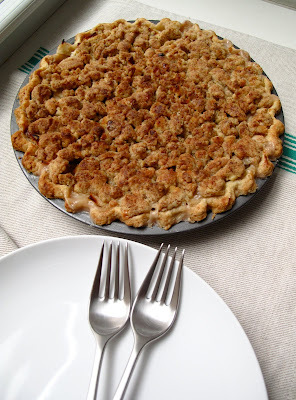 Is it possible to order the apple pie to be picked up this coming Sunday afternoon? Of course, I can make a pie specially for you, and plus, I always love to meet friends' friend! so I can give you me phone number and we can set up place and time to meet. Thank you so much! Looking forward to meet you.